Quietwater enthusiasts love Cherokee Marsh for its abundant wildlife and acres of no-wake water. On various days in the marsh, you might spot sandhill cranes, geese, ducks, bullfrogs, eastern painted turtles and carp and/or catfish kicking up big wakes as they skedaddle out of your way. Gauge notes: There is no gauge on the marsh itself. Water levels fluctuate but do not significantly affect paddling on the marsh. The pier is located off School Road and the landing acts as a visual gauge. If it is partially or completely submerged (as it was on this day), water levels are very high. If there has been significant rainfall in the Madison area in the preceding week, expect levels to rise. The marsh can be paddled at any level. Higher levels allow paddlers to get into some of the coves at the north end of the marsh that might otherwise be too shallow. It can also be difficult to navigate the lily pad fields when the levels have drawn down after high water. Time: Put in at 6:00p. Out at 8:30p. Wildlife: Sandhill cranes, bullfrogs, damselflies and numerous catfish and carp. Cherokee Marsh is a reserve that is meant to serve as protection of the Yahara River watershed. It essentially is part of the Yahara River system, acting as a buffer before flowing south into Lake Mendota. Not only is it paddleable but one might paddle through from upper sections of the Yahara or Token Creek. 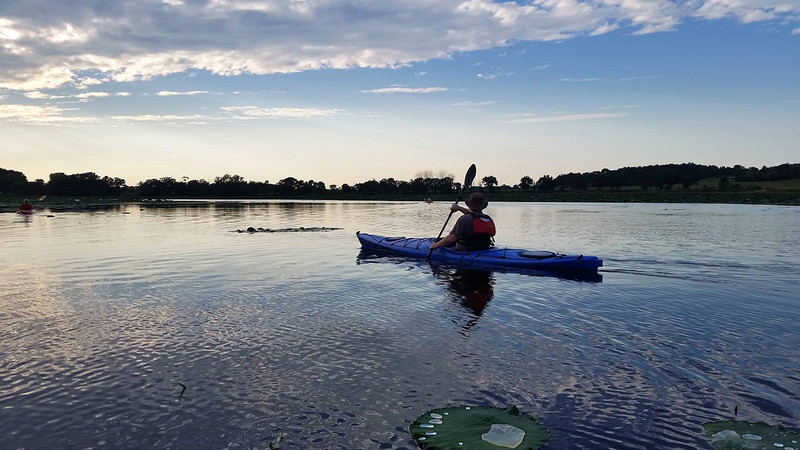 If you’re looking for a quick, relaxing paddle on a summer evening in Madison, it’s pretty hard to beat Cherokee Marsh. It’s at most a 30-minute drive from anywhere in Madison and the launch at School Road is superb. On this evening, we had perfect skies, temperatures and a breeze out of the northeast to make for a perfect paddle into the mouths of the Yahara River proper and Token Creek. Water levels were quite high – the pier at the landing was mostly submerged – which allowed us to access a few spots on the north end of the marsh that can be too shallow in average to low water. While out on the water, we were treated to a display of damselflies hitching a ride on our hats and kayaks, which is a common occurrence. The lily pads weren’t as thick as they were in 2016, so navigating through or around the fields was a bit easier. We saw and heard plenty of bullfrogs perched on the gargantuan lily pads (24 inches in diameter and beyond). On the north end, near the mouth of the Yahara, we disturbed plenty of catfish and carp – they kicked up big wakes as they move out of the way. All of this combined to make for a very pleasant there-and-back paddle on a gorgeous evening. While you’re in the area, if you paddle southbound toward Lake Mendota, you’ll pass beneath Highway 113 and railroad bridges (where you’ll first notice a bit of current) and eventually see Nau-Ti-Gal restaurant and bar on your left. Pull up to their piers or shoreline and grab a beverage. If you’re lucky, you may catch some live music they have sometimes. Cherokee Marsh is a easy paddle for those who enjoy flatwater, and its proximity to Madison makes it all the more convenient and appealing. There are only three drawbacks to paddling on the marsh, all of which were at least briefly in evidence on this trip. The first is mosquitos – typically you don’t need insect repellent before or during a paddle, but usually the mosquitos will eat you alive when you take-out, especially in the evening. That was certainly true on this night. The second drawback is that parts of the marsh can be choked with invasives like Eurasian milfoil and smell a little putrid both from decaying vegetation and runoff from surrounding agricultural operations. This too was true on this particular night, but luckily there is plenty of clear and open water to paddle. Lastly, because the marsh is on one of the approach and take-off vectors for the Dane County Airport, a quiet paddle will sometimes be interrupted by commercial air traffic or F-16 fighters from the Air National Guard detachment. Traffic was light on this evening, but there still were a couple airliners flying overhead. There are numerous routes to be explored on Cherokee Marsh. Usually the paddle is shaped by wind direction. Under normal conditions, the wind mostly comes out of the southeast, so paddling south toward Lake Mendota is recommended on the outbound leg to earn a tailwind on the return. If you have 3 to 5 hours to kill, you can usually do a loop around the entire marsh. You can also use the landing as a starting point for longer paddles into Lake Mendota or as a take-out for paddling lower Token Creek. Anglers will also enjoy fishing for largemouth and smallmouth bass and huge catfish – a couple guys landed a 12 pound cat as we paddled by.